It won’t be quite that bad… But we may be facing a serious water supply issue here in South Florida before long. Currently, the water level in Lake Okeechobee has been raised artificially one inch by backpumping heavily polluted farm runoff into it. This has caused algal and bacterial blooms, and residents living near flood gates where the water churns through and gets thrown into droplets are getting sick from the fumes. The South Florida Water Management District is getting ready to release this water at high velocity down canals to protect the heavily degraded Herbert Hoover Dike around the lake. So, anyone else remember a few years back when a severe drought left water intakes in the lake exposed and sucking air, and those intakes were revealed to be the water source for some urban areas in Palm Beach County? Also, anyone else remember the fact that there is a big unexplained cancer cluster in The Acreage, in western Palm Beach County? While we aren’t exactly going to be seeing residents outright acutely poisoned by their water, we’re not in great shape. 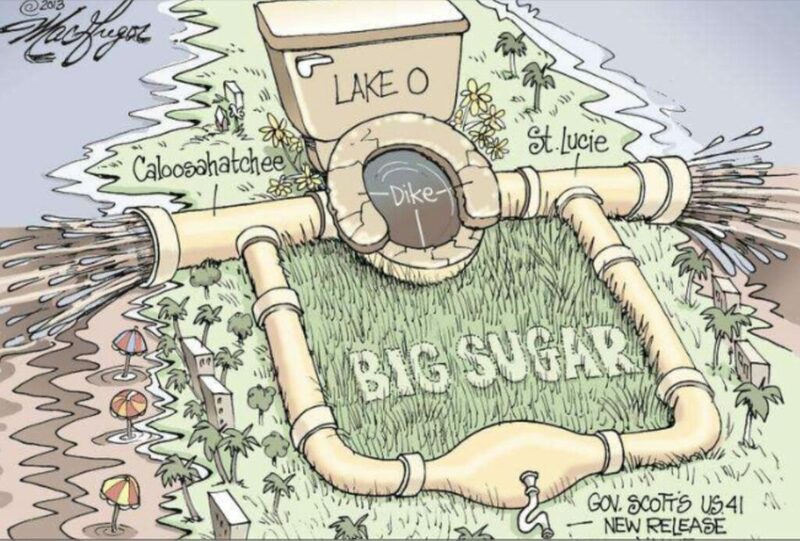 The blame can be very squarely placed upon the sugar farming industry and the Florida state government for prioritizing their sweet, sweet sugar money over the safety and well-being of the state’s residents. What a mess. Don’t forget to flush.